"The purpose of the (Performance Verification) test is to detemine if the car entered is correctly equipped and able to fully function and perform as designed, intended and expected when new" The NCRS PV Test Standard. Sounds easy: it is not. 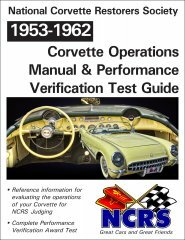 These manuals are a must-have guide for owners, judges, and restorers regarding the mechanical operational function of the 1953-62 Corvettes. They are an absolute necessity for owners attempting to achieve an NCRS Performance Verification Award. They are also a great guide for earning a high score during your Corvette's Operations Check during NCRS Flight Judging. They are also useful even if you drive your Corvette regularly and want to see how it rates.